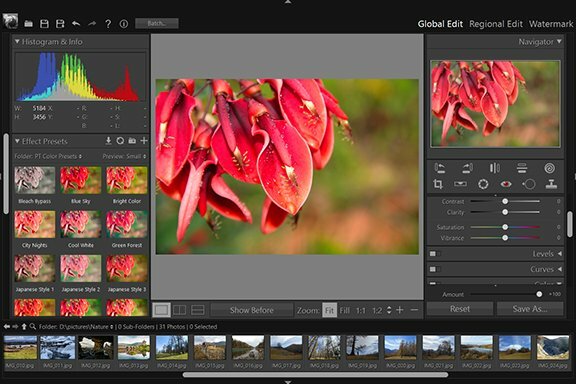 Clone Tool - GlobalEdit - User Guide of PT Photo Editor - Easily rescue problem photos. Make every shot its best. The Clone tool allows you to copy one area of an image and copy it onto another area. It is useful for duplicating objects or removing a defect in an image. 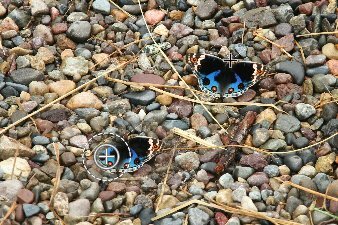 To use the Clone Stamp tool, you set a sampling point on the area you want to copy (clone) the pixels from and paint over another area. Select the Clone tool in the tool strip or press "O". Clone: Duplicate the sampled area of the image to the selected area. Heal: Match the texture, lighting, and shading of the sampled area to the selected area. To adjust brush size, scroll mouse wheel or tweak the "Size" slider in the panel. Dropping the "Hardness" of the brush will give you a soft edged brush so that the transition to the surrounding area is gradual. 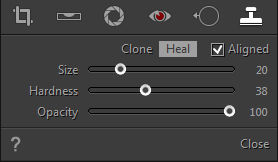 Moving the "Opacity" slider to the left will add some transparency to the clone/heal area. Aligned On: Samples pixels continuously, without losing the current sampling point, even if you release the mouse button. Aligned Off: Continue to use the sampled pixels from the initial sampling point each time you stop and resume painting. To set the sampling source you want to copy from, move your mouse to the area you want to duplicate and Ctrl-click.